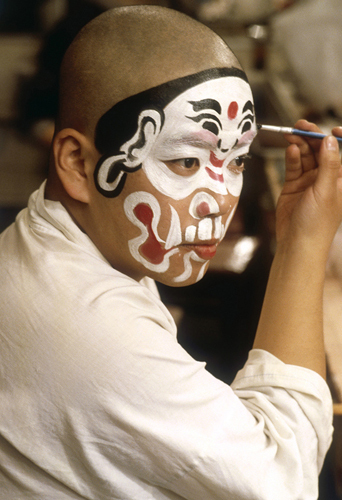 The colors of the performers’ painted faces symbolize the individual characters’ qualities. Red, for example, represents loyalty and courage. Purple stands for solemnity and a sense of justice, green for bravery and irascibility. 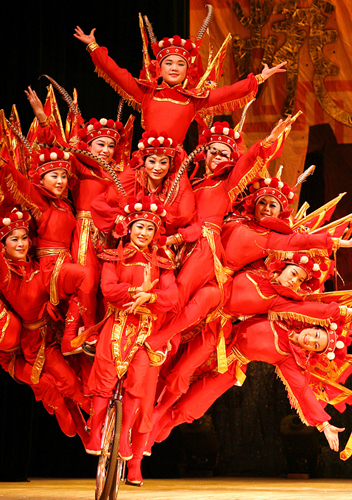 Beijing Opera is a form of “total theater” with singing, speech, mime, and acrobatics that combine graceful gymnastics and movements from the martial arts. Training is notoriously hard. Costumes are designed to make the jumps seem more spectacular by billowing out as they spin. Despite the dramatic visual elements of Beijing Opera, the Chinese say that they go to “listen” to opera, not to see it. Typically six or seven musicians accompany the dramatics. The stringed instruments usually include the erhu, or Chinese two-stringed violin, while percussion includes instruments such as clappers, gongs, and drums. 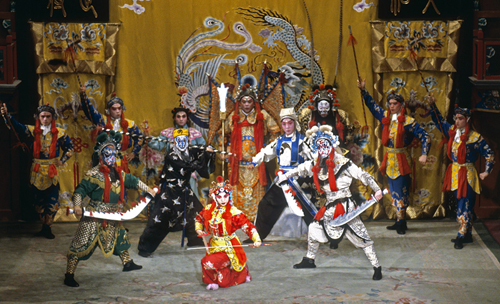 There are four main role types in Beijing Opera: sheng (male), dan (female), jing (painted face), and chou (clown). Sheng are divided into laosheng, who wear beards and represent old men, xiaosheng who are young men, and wusheng, who are the acrobats and whose roles are typically those of warriors. Dan are the female roles. Laodan are old ladies and caidan the female comedians, while wudan are the martial artists. The most important category, qingyi, usually play respectable and decent ladies in elegant costumes. Jing have stylized patterned, colored faces, and represent warriors, heroes, statesmen, adventurers, and demons. Not only are these characters the most striking looking but they also usually have the most forceful personalities. The chou are the comic characters and they’re denoted by white patches on their noses. Patches of different shape and size mean roles of different character. It is the chou who keep the audience laughing. Mei Lanfang was the foremost male interpreter of the female role (dan) during Beijing Opera’s heyday in the 1920s and 1930s. Traditionally all female roles were played by male actors, although no longer. The traditional repertoire includes more than 1,000 works, mostly based on popular tales. Modern productions aimed at tourists often include English-language displays of the text. 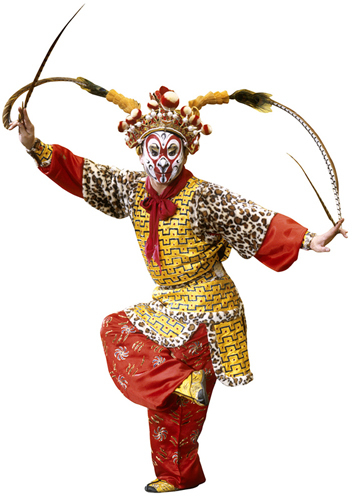 Clever, resourceful, and brave, Monkey is one of the favorite characters in Beijing Opera. He has his origins in classic Chinese literature. Daily two-hour performances of mostly complete operas. This steel-and-glass theater sits over 1,000 people. 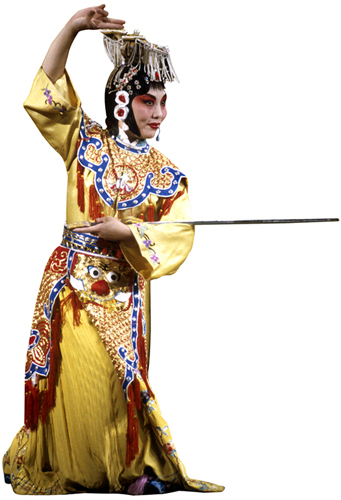 Daily 90-minute variety shows that include Beijing Opera. A famous teahouse hosting traditional Chinese cross-talk shows Tue–Sun.